Posted on July 6, 2011 | Comments Off on A new faucet. I did not think I would have a new kitchen faucet so soon. In fact, in the rank of purchases, it came close to the bottom. I assumed I would get one when we redid the kitchen which is quite a few months (years) of savings into our future. When Scott, however, re-plumbed the house, a new faucet was a must. The hot water in the old one simply did not work. When I first dreamed of faucets, I chose an American Classic on overstock.com. 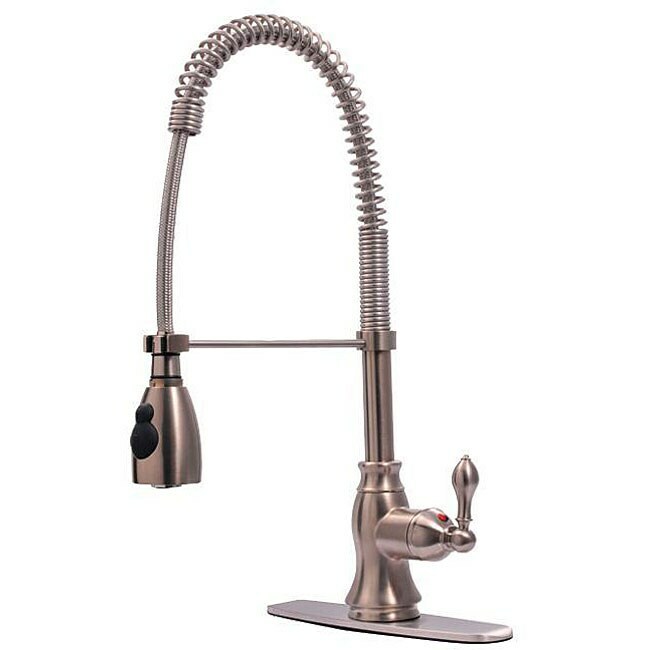 But Overstock does not currently have that faucet in shiny silver (chrome or stainless). The just have this one in nickel. But in researching similar ones, I realized that there are quite a lot of options out there and some of them are crazy expensive. Do you know you can spend thousands of dollars on a faucet? Well you can! I think I would rather pay that for a fridge and freezer or a fancy oven/stove! Anyways, thanks to August Fields, I was introduced to eFaucets, where I found this beauty. And eFaucets was having a sale. The reviews for this faucet are positive, and I think I can use it for years to come. I like the clean lines and modern flare. I think it will give a traditional kitchen a nice little umph. Can’t you picture it in a kitchen that looks a little like this ?